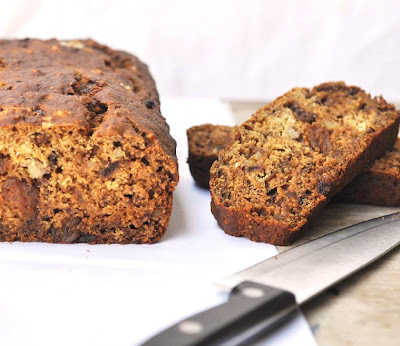 About two years ago, this banana date loaf kicked off my healthier eating lifestyle: with no or as little as possible refined sugars and flours. That has been my goal ever since. This sugar free cake convinced me that it is still possible to enjoy life and have perfectly sweet treats without stuffing myself with foods loaded with refined sugars. I virtually baked it every second or third day, as I satisfied my sweet cravings at any time of the day with it. It motivated me to search for other sweet AND healthier alternatives. I started enjoying cooking and baking healthily and I eventually started this blog in which I share my recipes with whoever is interested. After reading the books of the German doctor Max Otto Bruker (I wrote a little about his studies in detail in my post of 3 GRAINS BREAKFAST WITH 3 FRESH FRUIT), I decided to roughly follow his diet recommendations: plenty of raw foods, no processed foods, no refined sugars and flours. His most famous quote is, roughly translated: "Never eat anything that is being advertised for." Kicking of my chocolate addiction did not come with the package though. Until recently (let's say 6 months ago) I still had cravings quite often, especially in the evenings. It made me feel bad. By now, these cravings have been reduced to an acceptable amount. If they come, I am able to enjoy my pizza, piece of cake, chocolate bar or ice cream. I guess, a slow change is the way to go with any change of diet in order to establish it for the long term. Preheat oven to 180C. Line Loaf tin with parchment paper or grease with cooking spray. Put chopped dates, milk and soda in a pot and bring to over medium heat. Set aside. In a large bowl, combine flour baking powder and salt. Mix well. Knead in the cubed butter pieces until the flour becomes crumbly. Pour in the date milk mixture and mashed bananas. Mix until just combined. Stir in the chopped nuts. Pour the batter into the loaf tin and bake for about 45 minutes, or until toothpick comes out clean. Take out of the tin and let cool completely on a wire rack.